Deerfield Beach Movers – Moving is hard work. Even worse it can be extremely time consuming. 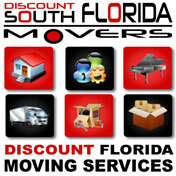 The experts at Discount South Florida Movers can save you a lot of time and grief by doing the heavy lifting for you. We have been operating all around Florida since 2001. Our team of professionals will guarantee your satisfaction with your move and our rates are the best around. Whatever your needs are for your residential or commercial move we have a service that covers it. If you have a special request, please let us know and we would be more than happy to accommodate it. We have experience with specialty items such as pianos, long distance shipping, and moving items into storage. Save time and eliminate the worry. Pick the pros at Discount South Florida Movers. Deerfield Beach is located in Broward County. Named after the deer that used to roam the area, this city of 75,000 is located in the northeast corner of the county. Although the city was first settled in 1890, it wasn’t first incorporated until 1925. It was originally an agricultural town, but given its location along the Atlantic Ocean has since incorporated tourism as well. There are a number of points of interest in this city. The Arboretum is a 9-acre botanical garden. There is also the Quiet Waters Park which features fishing, camping, and even a skate park. Other attractions in the city include the Pier, the Beach Islands, and Island Park. The city is also home to two libraries, Century Plaza and Percy White. Discount South Florida and Deerfield Beach movers provide low rates on residential, commercial, piano and long distance moving.